Frix Air expands your menu with sorbet / ice cream etc. Due to the small dose of 1-2 tanks you in the future many large specialty WITHOUT succeed at time of order. Diversity soup, sorbet / Eisvielfalt including diabetics Allergikereis, starter variations, your imagination has no limits. Process all return for more! 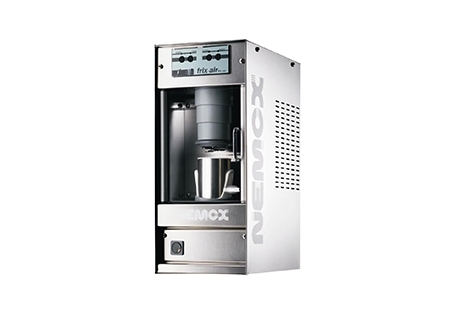 The powerful motor of 600W, the stirrer of stainless steel 18/10 and the electrical speed and performance monitoring, allowing a perfect finish ahead of the already frozen ingredients. This will give you just two minutes a perfect creme with an optimum temperature for consumption. We work with plastic containers that are placed in the stainless steel container. There is enough in the budget of a portion of plastic container that is included, sliced ripe bananas, milk, cream and sugar damaging. Then enter the container with all the ingredients in your freezer. Frix the frozen mass in the dishwasher-proof / mikrowellengeigneten plastic container with the Frix-Air in the appropriate stainless steel container in the device. You can enjoy in just two minutes an excellent banana ice cream!